Home > Chiropractic Care > Stop Smoking with Auriculotherapy! 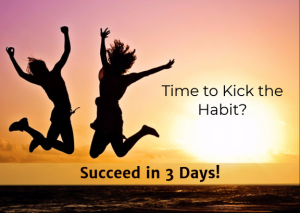 Increase your success with our Kick It and Quit Workshop! For less than what you spend for a two-week supply of cigarettes this program is a proven, effective tool that will help you quit smoking by minimizing cravings and the anxiety that often comes with quitting smoking. At this workshop learn to overcome the lifestyle habits that trigger you to smoke. After the workshop schedule your 3 sessions of auriculotherapy to stop smoking in 3 days. With this approach there is a 90% Success Rate in 3 Sessions. It is similar to acupuncture but there are no needles, side effects or contraindications.